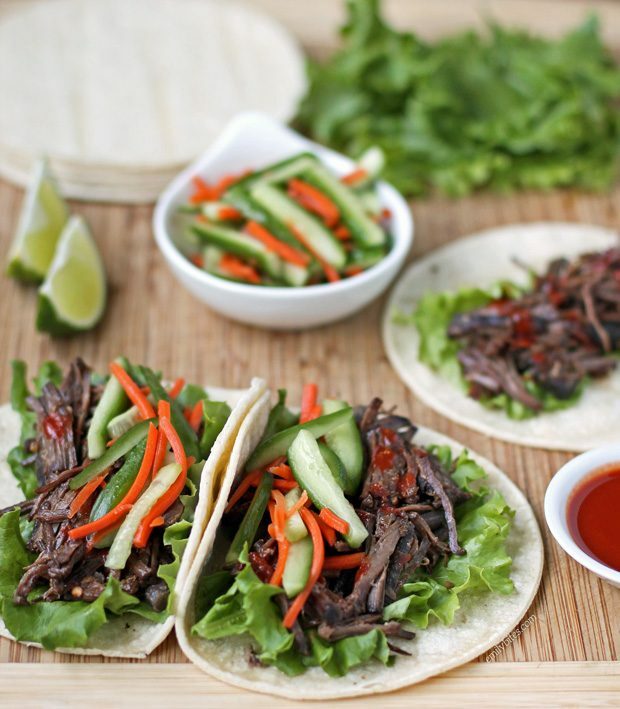 When Taco Tuesday happens to coincide with the release of the new Skinnytaste Fast and Slow Cookbook*, what’s a girl to do besides make these Slow Cooker Korean-Style Beef Tacos from the book to share with you all? That was my line of thinking anyway, so today is your lucky day! These tacos are so good. The beef is tender and flavorful from being marinated and slow cooked and it pairs perfectly with the bright, crisp cucumber slaw and the heat from the gochujang sauce. Giving your taco night a Korean-style twist is also a fun way to introduce some variety and your family or friends will definitely be impressed that you’ve stepped up your game in the gourmet taco department. I’m sure many of you are already familiar with the lovely and talented Gina Homolka and her food blog, Skinnytaste. You may even own her first book, The Skinnytaste Cookbook. I was a fan of Gina’s site long before I started blogging and Skinnytaste was one of my major inspirations in starting my own blog. I tend to think of Gina as the OG (that’s “Original Gangster” for the uninitiated) of lightened-up food blogging and I will always look up to her and be excited for her successes. For all these reasons and more, I was thrilled to be sent an advanced copy of Gina’s new cookbook, Skinnytaste Fast and Slow. The concept of this book is genius. It’s a cookbook meant for busy people who want to eat healthy (that’s all of us, am I right?) and is full of light and flavorful recipes that can either be completed in under 30 minutes (fast) or can be easily prepped and cooked in a slow cooker (slow). I told you it was genius. The book contains everything from breakfasts to sides to main dishes and desserts and it has icons throughout the book marking recipes as vegetarian, gluten-free, dairy-free and freezer-friendly. It also offers nutrition information for each recipe, making it easy for those who are tracking calories or points. 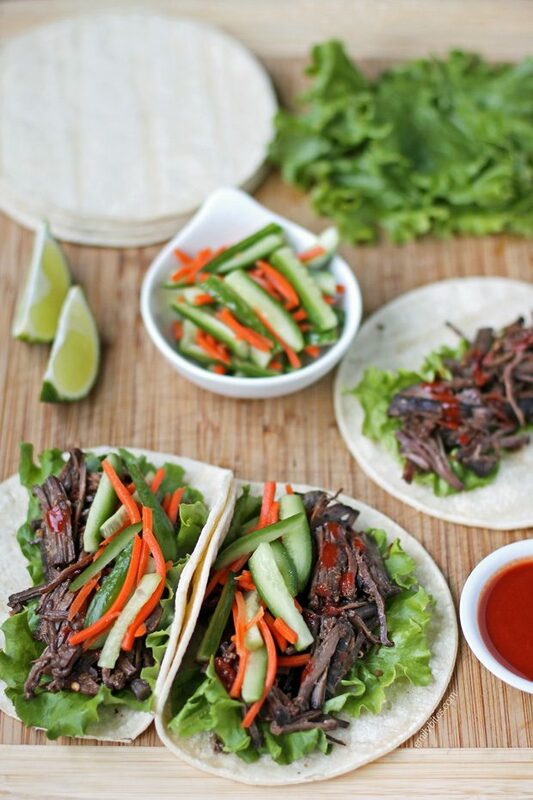 When I received the book I marked a bunch of recipes to try with post-it notes and after making these Slow Cooker Korean-Style Beef Tacos, I can’t wait to try more. 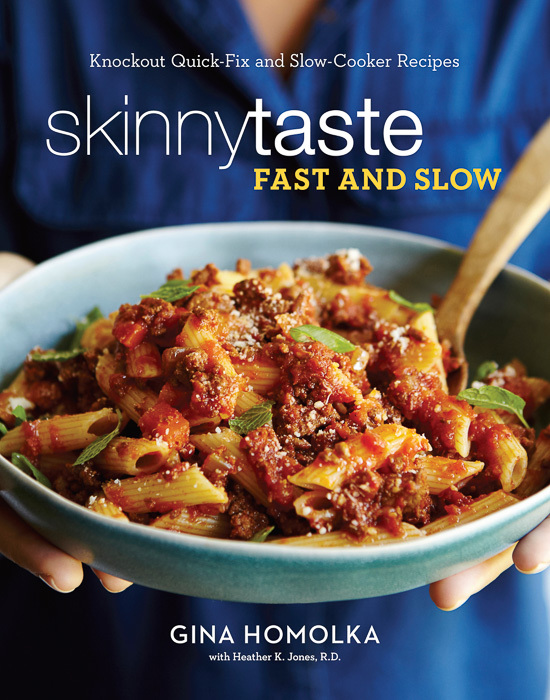 Skinnytaste Fast and Slow is on sale starting today and you can order a copy here on Amazon (affiliate) or go to your local Barnes & Noble or Target to pick up a copy of your own! Looking for more Taco Night recipes? Check out my Spicy Steak Tacos with Southwestern Guacamole, Taco Chicken Salad, Easy Taco Cups, Fiesta Hummus, Doritos Taco Salad, Spicy Beef Taquitos, Shredded Mexican Chicken and more in my recipe index! Place the flank steak pieces in a large shallow container or in a gallon Ziploc bag (I used the bag). In a small bowl, combine the soy sauce, sesame oil, onion, garlic, brown sugar, ginger and red pepper flakes to create the marinade. Pour the marinade over the steak and move it around to coat. Allow the beef to marinate overnight (or through the day if you’ll be cooking it overnight) in your refrigerator. Mine marinated for about 12 hours. In a medium bowl, combine all the ingredients for the slaw and stir until well combined. Set aside. Heat the tortillas in the microwave or in a dry skillet over medium heat for 30-60 seconds on each side. To build the tacos, divide the lettuce evenly among the tortillas and top each one with ¼ cup of the shredded beef, ½ teaspoon of gochujang or sriracha and ¼ cup of the slaw. Sprinkle the scallions over the top and serve with the lime wedges to be squeezed over the filling. I tend to have trouble with flank steak being tough regardless of how I try to cook/marinate it. Did you find that it was tender prepared in this recipe? Would it be possible to substitute another type of meat in this recipe? Thanks! I would substitute a pork shoulder, Em has another recipe that does that & it’s awesome! I plan on trying this for Taco Tuesday. But there are only 2 of us, any suggestions on what to make with the leftovers? I ate my leftovers straight up with the slaw (so good) but you could definitely serve them over rice and it would be delicious. Enjoy! Do I put the 1/4 cup chopped onion in with the marinade? I don’t see where to add it in the instructions. So I did make them for Taco Tuesday, I found them to be very tender. I would add a little more heat next time. I also went out and got the cookbook, even though the last thing I need is another cookbook! Ok. So I tried this in the pressure cooker. The meat was fine but not amazing. The slaw was superb. I’d say stick with the recipe as written, not a good pressure cooker recipe. I bet it would be awesome if I hadn’t decided to experiment. Writing this to save any other readers from killing the meat like I did in the pressure cooker. Does it cook ok even without any liquid? I feel like it would burn? Would it be possible to substitute another type of meat in this recipe? So I tried this in the pressure cooker. The meat was fine but not amazing. Thanks! iF I skip the tortilla and eat as lettuce wrap would points be 5? I’ve only the calculated the points as written so if you want to make changes to the recipe you will have to run the ingredients you want to use through the recipe builder. Thanks!